O melhor handpiece dobro novo do elight (ipl+rf) para o equipamento da beleza da para a venda – Máquina da remoção do cabelo de SHR fabricante da porcelana ( 106613141). W&T internacional CO. do PEQUIM LEADBEAUTY, LTDame! SHR is short for Super Hair Removal, a technology for permanent hair removal. This system combines laser technology and the benefits of the pulsating light method together to achieve practically painless result. Elight combines IPL and RF, which can stimulate deeper skin collagen and elastin fibers to rearrange and restore the degree of flexibility under the same power conditions, thus vascular tissues enhance to make the facial skin wrinkles eliminate or reduce and the pores shrink. 7. Skin-rejuvenation, skin-whitening and enhancement of skin elasticity. 1. ESHR20 shr permenent hair removal machine combine shr, Ipl and elight 3 system in one unit, is a very good cost effective option. 2.ESHR20 shr permenent hair removal machine combined with “In Motion” represents a breakthrough in permanent hair removal with light technology.The treatment is more pleasant than with the conventional systems and the skin is better protected. 3. ESHR20 shr permenent hair removal machine is suitable for all skin types, even tanners; Unlike traditional Laser and IPL, SHR can be had all year round without having to hide from the sun. 4. 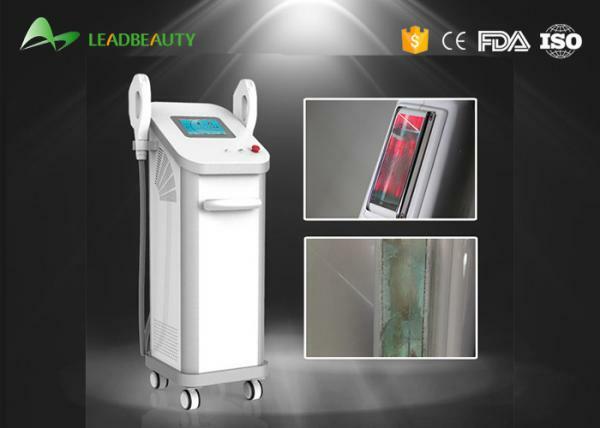 ESHR20 shr permenent hair removal machine utilize Germany imported flash lampand has 500, 000 shots life span. The treatment head is made of pure sapphire crystal. 5.The wavelength of 690-950nm for Hair removal and 560-950nm for skin rejuvenation are utilized. The special made crystal filters the violet light and infrared light, which can eradiate and absorb lots water from target skin. 6. 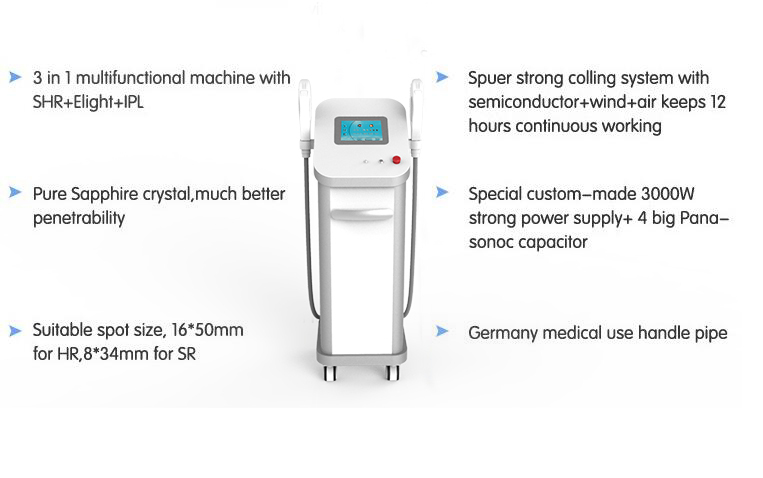 ESHR20 shr permenent hair removal machine is equipped with water temperature sensor, water level sensor and water flow sensor to ensure the safe operation. It canautomatically stop working when the machine has potential problem. 7.ESHR20 shr permenent hair removal machine is a single pulse IPL machine. Only 4-5 times is needed to remove unwanted hair and the client won’t feel painful. 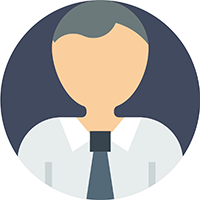 1.Our value message is "Quality is our culture"